Summary: Written for middle-grade readers, Eat Up! is a colorful infographic look at the many surprising and fascinating facts about food. Information is presented in easy-to-understand graphics and clear explanations. Each spread explores a different aspect of the topic. Readers will find answers to a wide range of questions, including: Who grows our food? Where does our meat and fish come from? How does it get to us? What’s the difference between a hybrid and a genetically-modified crop? How do companies advertise to children? Who are the “Big 10” food companies? How much farmland is there across the world? 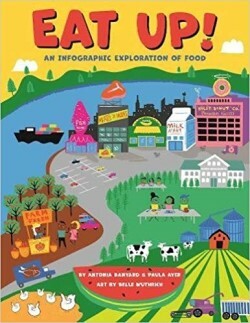 I love reading about food and this book (designed for ages 9-12) was a fun read. It’s laid out like a big infographic which makes it extra fun and easy to read. This is especially good for those who aren’t as good of readers because there are no long blocks of text as in a usual book. It’s not intimidating. This is a great addition to a school or family library as well as a resource for home schooling or school projects. I enjoyed the book. Buy Eat Up! at Amazon.com and help support the blog.